Perfect anywhere you’d like to charge two devices simultaneously while also using receptacles. The adorne Plus-Size Outlet offers greater plug capacity to accommodate larger products and features a classic look. This outlet features a total charging capacity of 3.1A. Found in adorne catalog as "Dual USB Plus-Size Outlet Combo". Rated 5 out of 5 by Val23G from Works well Love having a dual usb outlet in the house. makes it so much easier to charge phones at night! Easy to install and works well as a regular outlet and a usb. we will definitely be adding more to our house in the future. Rated 5 out of 5 by mikester from Dual USB Outletq I am so happy & thankful to have found this Dual USB Outlet! I have been saying for years now that outlets should have these, since everyone has smartphones, kindles, ipads, etc... that need to be plugged in. It was very easy to install, and now I have plenty of USB outlets around to plug my devices in. I would highly recommend. Rated 5 out of 5 by KT2018 from Great design Bought this Dual USB with outlet from the Adorne collection give me the USB charging and outlet while still blends with the rest of the Adorne outlets. Rated 5 out of 5 by ashah81 from Great wall outlet! This Dual USB outlet is perfect for my home. It not only gives me access to put in regular plugs but can i also used the USB to charge my phones and tablets. This makes it versatile. I highly recommend in all homes. Rated 5 out of 5 by Micwal from Great Quality! We are currently renovating my 11 year old sons bedroom. 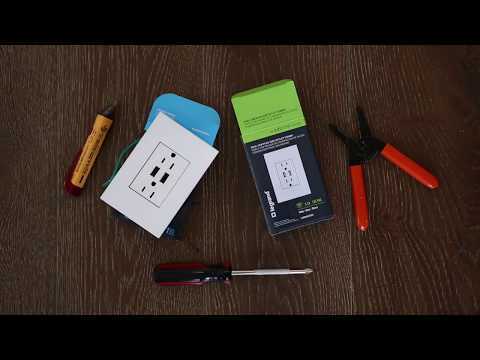 The dual USB outlet a long with your standard electrical outlet is an ingenious design a must have for any home. I cannot wait to upgrade our entire him to these outlets. I have installed the outlet, and the USB outlets work, but the electrical outlets do not allow anything to be plugged into them? That is correct - the design of the outlet was not done carefully and for most shapes of the plugs it makes the access to th USB ports impossible. Try to play with the plug location and check if when used up or down it does make the access to the easier. Will the DUAL-USB OUTLET fit in a 1-Gang plate. &nbsp;Or do I need to order a 1-Gang+ Adorne plate for this? Good Morning, You would need the 1-Gang+ plate for this Dual USB Outlet. Hope this helps! Can I use this outlet on the load side of a GFCI outlet? *Note I am not an electrician. The outlet wired just like a standard outlet. I didn't see anything that would lead me to believe it couldn't be wired so that it is protected by a nearby GFCI. Because mine is in a bedroom I didn't check for any current leakage that might inadvertently trip a GFCI. How can I make this a switched outlet?